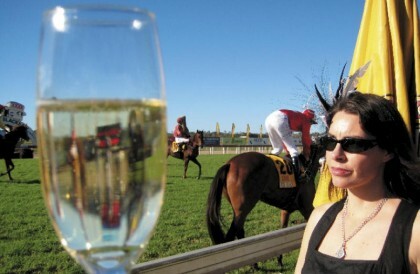 To get glammed up and have a flutter at the AU$720,000 Caloundra City Cup race day on Australia’s Sunshine Coast. Before leaving New Zealand, we pay a visit to award-winning milliner Diane Dudley of Urban Turbans, in Devonport, Auckland. “Nothing too frou frou,” requests my travel companion, Philomena O’Brien, before being fitted with an elaborate black-and-white headpiece in the shape of an exploding star. Diane, a specialist in race day millinery, assures us our hats will be subdued compared with what we’ll see on the big day. But Philomena looks unconvinced as we leave the store with a huge, hexagonal hatbox. Arriving on the Sunshine Coast, we head for our apartment at the Hyatt Regency Coolum. The resort is set in 150 hectares of rainforest and bushland, and is bordered by stunning coastline—but more critical just at this moment are the huge double bathrooms in our generous two-bedroom apartment. Ideal facilities for the primping and preening necessary before we mingle with those bronzed Queenslanders! We emerge some time later, looking suitably polished, attired in bright, breezy dresses and with fabulous hats—or ‘fascinators’ as they’re known at the track—carefully fixed in place. The Hyatt bellhop arrives to transfer us across the rainforest to reception. Larry Johnston, our driver for the day, opens the door of our waiting limo and we are whisked star-like to Corbould Park in Caloundra, where the City Cup is to be contested. During the half-hour drive, Larry mentions that John Travolta once sat in my very seat. How do our head adornments stack up against the Aussie competition? We very quickly discover Diane was right. Our headpieces are dwarfed by large pink hats, spiky turquoise fascinators and extravagant cream feather and lace combos. 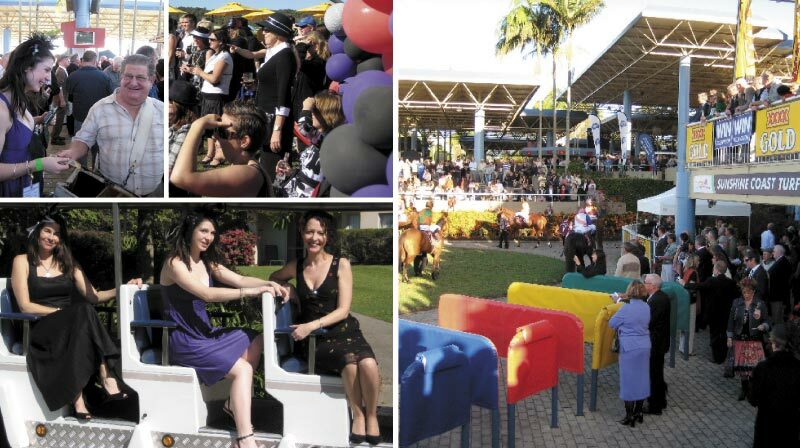 The crowd includes Brisbane movers and shakers, locals and rural families—all out for an entertaining day in the sun. We spot elegantly costumed children, girls clad in zebra-stripe sundresses and garishly turned out lads sporting jaunty hats. Because the balmy Sunshine Coast weather makes a great winter training ground for both New Zealand and Victorian horses, many owners bring their horses to train locally, thus making this one of Queensland’s biggest race days of the year. The toilet queue—need I say more. As novice gamblers, we first have to get to grips with the lingo. The ‘colours’ are the racing silks (jacket and cap) worn by riders to connect horse and owner. A ‘scratched’ horse, we learn, is one that’s been taken out of a race before the start. A ‘closer’ is one that runs best down the final stretch. Next, the intricacies of betting. ‘Across the board’ means betting on a horse to win, place and show. If our horse wins, we collect three ways; if second, two ways; and if third, only one way, losing the win and place bets. ‘On the nose’ means betting on a horse to win only. And there’s more. A ‘quinella’ is a wager in which the first two horses to finish must be selected, but in any order, while a ‘trifecta’ requires selecting the first three horses to finish in the correct order. But with a ‘boxed trifecta’ your three picks can cross the line in any order—as long as they’re the first three. As for choosing our steed—we soon discover there’s more to it than simply going for the name we like best. “It’s a strategy a lot of people subscribe to,” says John Fitzgerald, former race club chief executive and current Tourism Sunshine Coast chief executive. He’s the expert on the area and the horses, so we trust him to explain the ‘ins and outs’. We grab a racing guide and look at form. Today, the track is slightly damp from the previous week’s rain. We learn to scan the DWT (Distance Wet Track) column to see which horses have had the most wins. John suggests we play it safe by backing favourites, or second favourites. There’s a betting station in the Champagne Garden, but we decide to work our way through the throng in front of the main bookies’ stall. Punters yell out their bets and money and betting tickets hurriedly change hands. Bookmaker Bob Turner Senior accepts my Aussie tenner for a $5 win and a $5 place on number four, Can Man. We head back to the track edge in anticipation. If Can Man can, my pockets will be $30 fuller. As the horses gallop over the finish line it seems Can Man can’t. Armed with this fresh information, I head back to the bookie to place a $2 win-only bet on Bikkie Tin Blues. If she wins I’ll collect a $62 dividend. Twenty minutes later, I’ve got the blues. Bikkie Tin barely finishes. I decide to forgo John’s tips for one last bet, and go with my lucky number—eight—and Scoot. The crowd jostles to get the best view for the final race as the frenzied cloud of horses, heat and colour press closer to the finish line. Divots fly and the jockeys rise in their saddles, urging their mounts down the straight. The commentator rattles off names and numbers, and everybody listens for the name on their betting stub. Sadly, Scoot isn’t as quick as his name suggests … perhaps this betting stuff isn’t quite for me. The Queensland sun casts a golden glow on both the elated and the disappointed as the crowd weaves through the gates. Families push prams and inebriated fashionistas teeter on their stiletto heels, hats askew. My wallet feels decidedly depleted. Just as well it’s not just about winning—the thrill at Caloundra is all in playing the game.